This time, I’d like to give you one exercise to try it out for yourself. When properly done, Kheperu puts the priestess or priest in touch with a deeper wisdom that should serve as guide in any act of magic, mundane or spiritual. It means no more—and no less—than placing the Divine part of yourself in contact with a greater Divine power, in this case, Isis. The potential that this offers for spiritual development as well as for practical magic is immense. 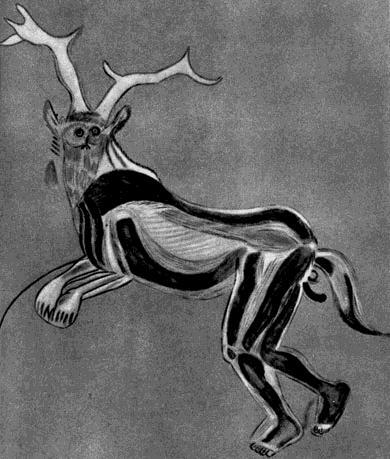 Kheperu has been around for a VERY long time; this is the famous cave painting believed to be a shaman in the Kheper of a stag. The human hands, feet, and face are the clue. People differ in what they believe a Kheperu or—as it is usually known in modern ceremonial magic—a God/dessform is. Some consider a Kheper to be a purely human psychological construct. Some consider the imaginal form to reflect an archetype, which in turn, reflects a Divine Being or reality. Most will consider the Kheper to be a little of both—a sacred and enlivened image to which both humanity and Divinity contribute. To me, a true Kheper is an image that interprets the Divine energy of a particular Being or aspect of the Divine to the human being. Normally, it would be an image that has some history behind it, an image that has been invested with human spiritual, mental, and emotional energy for hundreds or even thousands of years. To use Jungian terms, it is an image recorded in the Collective Unconscious. By assuming the Form, we make it conscious rather than unconscious. These images are alive by virtue of the energy, Divine and human, invested in them. Like the ancient Egyptian who “travel as Isis” and so became Isis, we, as modern priestesses and priests, can also put on the image of the Goddess and become Isis. The invocation of Isis by Kheperu becomes a great, sacred cycle of inflowing and outflowing energy, from human to Divine, Divine to human. If we succeed in doing this, we will certainly know it—for the feeling is very unlike any normal state of consciousness. We may feel as if our body, soul, mind, and spirit are tapped into a stream of energy coming from outside herself, a stream which extends beyond the physical and touches invisible realms. We may perceive the self as enormous, towering over the earth or suspended in space. Actors do a form of the technique when they “become” their character. Masks help, too. We may have a feeling of expansion in the heart or little rushes or spasms of energy throughout the body. We will feel the presence of Isis and may participate in the creative and magical energy that is a part of Her nature. Through the image of Isis—perhaps seen as the image of our own Higher Self wearing the wings and throne headdress of the Goddess—we will be able to use some of the power of the Goddess Herself to initiate, empower a rite, charge a talisman, or commune with the Goddess. We will also discover that true Divine contact, though very powerful, is humbling and does not idly flatter the ego. We may come to believe, as did the theurgists and Hermeticists of old, that the Divine Ones participate in our assumption of Their Forms not merely because of Their harmony with the images, symbols, and names employed, but because of Their Goodness and Divine Love for us. We will see that when we expend our effort to reach out the Them, They will in turn stretch out Their hands to us, guiding us, assisting us in our magic, and most importantly, helping us grow spiritually. This small rite of Becoming Isis is from Isis Magic and visualizes Isis in Her role as Lady of Heaven, Earth, and the Underworld. Priest/ess: I invoke Isis, the Giver of Life, Who pours out the Inundation, She Who makes green plants grow and all people live. I call upon Isis the Ever-Living, Who offers Her abundance to all the souls of earth. I ask Thee, Isis, Lady of Heaven, Lady of Earth, Lady of the Otherworld, to come. O Lady of All Who brought all things into existence through what Her heart conceived and what Her hands created, come to Thy child. Come, Thou Who art the Living Soul of Everything, come to this, Thy temple, and to this, Thy Priest/ess. Let me take on Thy Kheper, Thy Form, Thou Goddess, Isis the Great. Let me be Thy garment. Be seated in a comfortable, meditative posture and close your eyes. Visualize the form of Isis as described in the speech that follows this explanation. Imagine the Goddess as very large, with Her feet in the Underworld and Her head in the Heavens. Next, visualize yourself growing larger and larger. Notice how your perceptions of the world change as you grow. When you are almost, but not quite, the same size as Isis, turn to face Isis and look into Her eyes—if you can. Bow in respect, then turn so that the image of the Goddess is once again behind you. Now, imagine stepping backward into the ethereal Kheper of Isis. The face of Isis is before your face. The wings of Isis are upon your arms. The heart of Isis surrounds your heart. The body of Isis envelops your body. The feet of Isis uphold your feet. Through an act of will, now let yourself expand to completely fill the Kheper of Isis. Priest/ess: (Speaking in the Kheper of Isis, as Isis) As Isis, my form is that of a beautiful woman with shining Wings. I am crowned with the Crescent of the Moon and the Disk of the Sun, and above them rises a Star that rests upon the image of My Throne, for I am Queen of Heaven. In my right hand I bear the Lotus Wand with which I enliven all of nature. In my left, I bear the Ankh, for I am the Mother of Life and the Lady of Re-birth. Light pours forth from My form. I am the Great Goddess. I am called Isis the Divine and Lady of Words of Power. I am Isis the Magician. I am the Movement Around the Still Point. I am the Form and I am the Ritual. I am the Shaper of the Forces. I am the Goddess Throne, Maker of Kings and the Seat of All Being. Through knowledge of Me my priestesses and priests learn to guide themselves with Wisdom. I am the Light-giver of All. I am Isis. Allow as much time as you desire to experience the energy of Isis. You may receive a greater understanding of the nature of Isis. You may see visions from the point of view of the Goddess. You may hear the words of the Goddess in your mind. All these things are experiences of the energy of Isis. When the experience is complete, end the vision by thanking Isis. When you are ready, take off the Kheper of Isis by reversing the procedure for taking on the Form. Visualize yourself growing smaller so that you no longer fill the image of Isis. Step forward out of the Form, feeling your separation from the image of the Goddess. When you have separated, turn to face the Goddess and bow in respect. Then allow yourself to continue becoming smaller until you return to your human size. Become aware of your human size, shape, and the feeling of your own human energy. Open your eyes and come back to yourself. Priest/ess: I thank Thee, Isis, the Giver of Life, Who pours out the Inundation. Isis, Who is the Living Soul of Everything. I thank Thee for allowing me to take on Thy Kheper, Lady. I thank Thee for letting me be Thy garment and for receiving this glimpse of Thy Divinity. Guide me ever by Thy hand. Be in Peace, Goddess. Amma, Iset. Close the rite in the manner appropriate for the opening, then quit the temple. I hope you will share with me your experiences with Isis. Be blessed beneath Her wings. This is the same idea as the Wiccan Drawing Down of the Moon, which has always been a very powerful experience for me. Thank you for the history and your thoughts about Kheperu. due to this is is quite hard for some of them to still incorporate both into one…some are struggling with this experience and only once they have remastered this within their new physical form are they ready in the physical to teach the knowledge that they have within…and help guide this knowledge for all into wisdom…every time they get invoked they jump out of their physical form and work within the etheric…. Some of the masters are still children…and are still learning the ways of this world once again and trying within to remember their true authentic self…The unveiling has begun of such and their are some now in the physical that know who they are and have always known…. I won’t deny what you say deeply reasonates with me. And I do believe the same goes to those who come from the stars as well. Remembering the facet of their divine selves while equally too embracing the human bits as well. Becoming divinely womin and divinely men. It is a challenge, especially when so many ego, unconscious and subconscious patterns upwell and more powerful when unheard. (My current challenge). It takes so much patience to work through it all, and takes so much courage and trust in ourselves and the divine that we can succeed. Truly and completely. I’m curious, and would like to know if what I dreamed is a reference to this. It didn’t occur to me until I just read the invocation. I had a dream of her about two weeks or so ago. I can’t get the exact phrasing but she seemed to say something to the nature of “Step up onto (it could have been more like “upon”) my feet and I will support you.” If you could give me some insight on this I would be appreciative. Have you heard of anything like this before. It was quite unusual and definitely felt authentic. What would you take this to mean. Could this be a reference to using a Kheperu? Thanks. Very interesting! Do you work with Isis regularly or was this a first-time connection with Her? If it was first time, it sounds like it would be an invitation to come to Her. If you work with Her regularly, it could be an invitation to use Her kheper, or at least to begin learning about using them. On the other hand, it might simply be an offer to lean on Her strength in your everyday life…walk in My shoes, that sort of thing. Either way, it is a dream I would be very pleased to have dreamed. Wow. I’m very honored then to received such an invitation. It’s really a first time for me. I only have just started experimented with meditation involving her to try and connect with her this past month. She has come to me three times this month counting the one I mentioned. The second time she said something to the nature of “meet me in the middle” or possibly “come up and and meet me in the middle.” Now, that one has me vexed.lol The third one is the one I regret not writing down (I now keep a digital recorder next to my bed) It was a long enough of a message to wake me up. I thought to myself, “well I won’t forget that”. Unfortunately, I am unable to remember this message. I still have a feeling from it though that leaves me with this feeling of familiarity and nostalgia. Needless to say I will not be making that mistake again.lol Thank you for your help and if you have any thoughts on the other message and possibly a way to become more proficient at remembering my interactions when they happen. Thanks again. Ah, that’s so often the trouble with dreams 😉 But you can connect with Her in meditation as well…easier to remember or even write things down once you’ve had some practice in maintaining your meditative state while writing. It would be worth trying…get in a meditative state, invoke Her, and ask about the message. Thanks a lot for the advice. I will definitely be doing this. If you would like I’ll keep you updated. It’s been an amazing experience. Thanks again. I’m not sure if you check this thing, but I’m hoping you may be able to answer a question. I began practicing after feeling the call last year, and since then I’ve noticed this odd occurrence happening every so often. I can tell you that this most recent one corresponded with the Pink Moon that just passed, but I can’t say with certainty that that’s a pattern. Here’s what happens: at night, I’ll step into my bathroom. I’m usually not doing anything special. No casting or opening of any kind; I don’t really even have any intention behind it. All I do is look in the mirror and it’s like something activates. The air around me turns a sort of blend of earthy colors, like clay red, ochre yellow and green. The sensation is like being imbued with power. Not to be explicit, but this time I felt my breasts engorge and my pupils dilate (but that usually happens). This time I was about to take a bath, so when I saw my husband later on in the night he was immediately on me like white on rice! And no, my cycle is not perfectly in sync with the moon, so it’s not like I was ovulating or something. My connection to Isis lead me to believe it was some kind of Kheperu thing. I understand this to be very similar to Drawing Down the Moon. I’m not quite certain if I’m supposed to do something with it or if it’s just some kind of energy refill? What do you think? Well that’s certainly interesting! Couple questions…about how many times has this happened? And, you mentioned that you began practicing last year. What have you been practicing specifically? Even if you weren’t doing anything at the time you look in the mirror, it still might be affected by what you’re doing at other times. The colors you mention are spot-on Qabalistic Malkuth colors, that is, material world, roughly earth colors as you note. And power from the earth would be natural. Not sure if it’s a Kheperu thing…that’s usually (or should be) intentional. Unless you’re working with that technique in your practice otherwise? It sounds like it’s a positive experience. Is that how it’s felt to you? Has it interfered in your life at all…like happening at inappropriate times? No, it doesn’t happen at inappropriate times, and it doesn’t interfere with my life. It’s like you said, it feels like a positive experience. It might happen once a month, which made me think of Drawing down the moon or Kheperu. Maybe more, maybe less. I’ve experienced it several times since my calling last year, but not usually more than once a week. I practice Druidry, and so that earthen aspect does make sense in that regard. I also practice some of the rituals from your Isis Magic book. 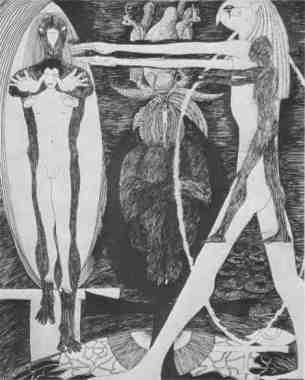 I receive visions as well, and after googling Malkuth, it does indeed correspond with many of the images I see. Recently there were lots of bridal images, which with Beltane just passing didn’t surprise me. Isis has been connecting me to the cycles of the Earth, and connects some of the rituals in your book to those times. For example, Osiris into the Moon for Beltane, the reemergence of Sirius Ritual for summer solstice, a lamentation for Lughnasadh, etc… Though I must admit that some of these are difficult to perform when they’re meant for a group and I’m all alone. I experience a lot of phenomena that are foreign to me. The druids don’t seem to understand it, and neither do the witches. You’re the first person to have some solid insight… Perhaps that means that I should go the Hermetic path instead, as that seems to have the answers. Hello, Mad Madam (and by the way, I love your madness…as I am also a mad maenad of Dionysos!) Your experiences intrigued me, so I meditated with Isis a bit about what you related. The main thing She focused on was the mirror aspect of all this. A mirror is a reflection of yourself…or perhaps, of Yourself. So you may be seeing an empowered, magical vision/version of Yourself. And actually feeling the effects…which are positive and non-intrusive. May I ask, are you relatively newly married? The strong sexuality and bride images would suggest that…either that OR you’ve having a lovely reinvigoration of the sexual aspects of your marriage. Which is a fabulous thing to have happen if you’ve been married for a while. Honestly, my thought is…enjoy it! Keep to your practice and training. Pay attention to the earth energies of all of this. They may be calling you in that direction. But you are very new to all this. It can take many, many years to find your true magical self—even if you’re getting a preview of her now. Take note of what happens, in your practice and on these occasions to see if there is any correlation. Journal it if you can…you will find insights when you look back on it years from now. One final question…if you didn’t want this to happen, could you stop it? If not, that would be a good thing to work on. While it is, so far, a good experience, a witch/magician/priestess/druid (whichever you may be going for) wants to be able to control her magic. Also, I’ve never performed Kheperu. The one time I was going to perform the ritual, I went to the bathroom to wash up and was activated one again. I thought maybe they were similar or the same, and went on to perform the ritual with that energy. And if I channel that earthy energy long enough, I can typically get it to turn white over time. Thank you for asking her! In my communication with her, my clairaudience at this point isn’t great, though the visuals are strong. So I appreciate you delving into the specifics… I feel like I’m at the point where I can’t see the trees for the forest, though I’m sure she would say that’s really just a part of my nature. It’s very likely that she’s trying to get me out of my head and to be present upon the Earth. She does this by telling me to live her mythology throughout the year. Archetypal periods, I guess you could say. I’ve recently moved from the Magician to the Empress, from what she says. You saying that she stressed the mirror reminded me of something she said: Seek Power in your image and use it wisely. She gave me rather specific instructions on how she would like me to look, too. I’ve been slowly implementing that advice. My magical self, I like how you’ve said that. I think she’s been trying to help shape that. I’ve received some interesting insights about that self that were very difficult for me to process. I think that thinking of it in that way, that she is shaping the mythology of my magical self makes it easier to accept. It was a bit overwhelming trying to think of it in any sort of “real” way. She’s made it clear that she does not want me to abandon the druid studies, but she doesn’t mind me familiarizing myself in other traditions if it gives me better understanding, as that establishes trust in what I’m doing. So I’ll begin a Hermetic research stage, but I’ll keep doing what I’m doing. I’m really too intrigued not to look now, as there was so much imagery I’ve had that correlates Malkuth and Kether. Receiving that energy kept me from doing that more advanced ritual of Kheperu in the past, so maybe she was trying to tell me the same. And yes, I can stop it very easily if I want to. It’s as simple as flipping a switch and doing something else entirely. That’s what made me feel so safe about it, but it was worrisome that no one seemed the understand what I was describing! It’s just so nice to speak with someone who seems to understand. I appreciate you. Well, Summer Solstice came and passed… My husband and I conceived that night. Unplanned, but welcomed. Since then, my Sephiroth-y colors are different – Gold and White. It happened with last night’s full moon.